Young people could make a lot of change. Why aren’t they? 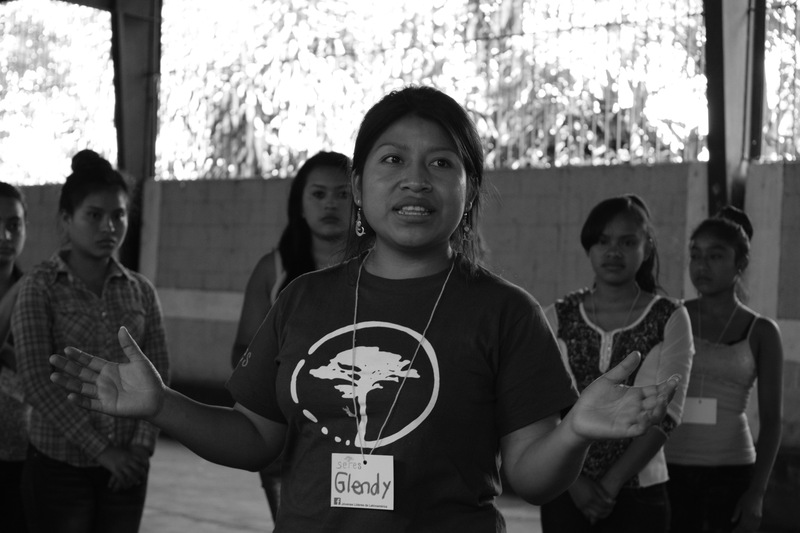 A young teacher explains the precarious situation of the Guatemalan education system. By Glenda Marisol Xulú – Primary school teacher and bilingual and intercultural education specialist. In Guatemala around 70% of the population is under 30 years old. This means that there is a big percentage of young adults and the rest are going to be young adults soon. Young people have the energy and potential to make many changes in the social, economic, environmental, and political arenas. But why do the majority of young people not participate in those spaces? Why aren’t they participating in decision-making in their communities? In Guatemala there are several factors that lead society not to cultivate the basic skills and critical thinking that would make young people more influential and active in creating positive change. Many young people worry more and more every day about how they look and how much money they have (though they want things to be easy), and about how attractive their boyfriends or girlfriends are. They pay more attention to TV shows and social networks, and they follow trends that disconnect them from their culture, their identity, their history, their mother earth, etc. Read about the young people of SERES who take the initiative and ignite change. They have let conformism enslave their thoughts and their hearts, leaving aside their education, growth, and empowerment. This leads to isolation and ignorance of the current social situation of the country and their communities. The Guatemalan education system has a lot to do with this. Guatemala does not offer quality education. It’s as if it were designed to maintain the same cycles and keep the people impoverished, fearful, ignorant of their rights and everything that’s going on. But why don’t we have a quality education system? One of the fundamental pieces to quality education are the teachers. They lack familiarity with different subjects, techniques, and methodologies that would leave behind traditional teaching and lectures to transform the education system. We have also seen that there is no love or passion for what they do. (Not all lack passion but the majority do.) And if we don’t feel that from the teachers we can’t hope that children and teenagers will be very successful in their personal and professional lives, and that they exercise their rights to civil participation. But how can we expect teachers to offer quality education if they were educated in the same way? It’s a cycle. This is why individuals haven’t developed the basic skills that would make them people of critical thinking, influential people, entrepreneurs, or people who take initiative. The most we achieve and develop is to memorize and remember. They educate us to work and yo obey. This is what I’ve experienced, seen, and heard on the bus, in the street, in the university, and I’m sorry to say that I was educated the same way. I can give three examples of problems that I experienced in Guatemala’s education system. But it wasn’t like that. There were only three or four who said something like that. The second example is a sign at an educational institute that I saw at the entrance of Zaragoza that said, “Yes, we DO teach you to work.” The first thing I did was laugh, and afterward I reflected on how we’re educated in school. Glenda Marisol Xulú, during a SERES workshop. And not much has changed since. I’ve seen how teachers pass students to the next grade though they haven’t passed their subjects because it helps them keep their paycheck. The contexts are different because opportunities are different. If a father, mother, or teen wants a “quality education” they have to pay to access it, and few have those opportunities and resources. For the government, public education is not a priority. That’s why every year the government does not budget the funds necessary to provide the education system even the basics. Many schools are physically anti-pedagogical. There are no desks, and if there are they’re old and deteriorating. They lack resources and supplies, like textbooks. Further, school food arrives very late. In 2016 the value budgeted for each student’s meal was Q1.11 ($0.15), a ridiculous amount, considering that every year food prices are going up. Every day we see that technology has advanced but our schools don’t have these resources and neither do our teachers know how to use them. That’s why many students who graduate from high school don’t even know how to use basic Microsoft programs. Incredible, no!? But that’s how it is in Guatemala. Parents have a very important role in their children’s education and training. But how can we hope that parents can guide, shape, and reinforce their children’s scholastic educations if they themselves never got support from home and never had the opportunity to go to school or finish elementary school? It’s also important to mention the economic conditions of the country. People make little working in the informal sector, on plantations, in the streets, and food prices are always rising. Businesses pay little to small farmers for their harvests but end up making a lot off the final product. There are many who work from dawn until night to provide only the basics for their families. How then can a mother or father find the time and energy to be with their children to reinforce their scholastic education? And if they’re worried about basic expenses on food, clothing, school costs, etc? That’s why parents allow and want schools to take full responsibility for the education and training of their children, putting aside their parental responsibilities. 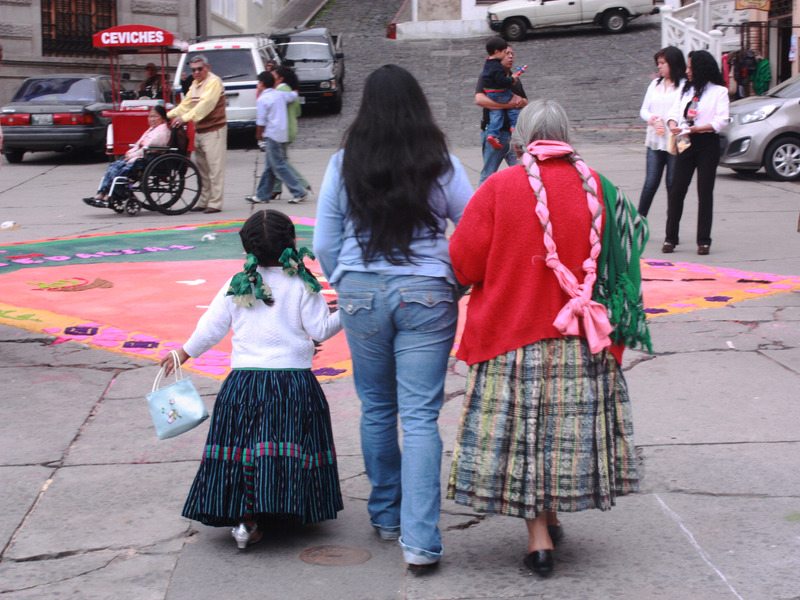 Tres generaciones en Xela. Foto por Patricia Macías. You have the power to make change! When you’ve developed your most important skills, when you understand the reality of your community or your country, when you’re conscious of your duty or role as a citizen, this awakens a spirit of entrepreneurship, leadership, and change. Through this, you can act, and create positive change on a personal, community, or any other level. We are seeing a vicious cycle, and if we don’t break it today, we will continue as we are for many generations. So don’t hope that the situation or the country change if you don’t begin to change, if you don’t get involved, if you don’t act in your community. This generation has the power to make changes so that our children and future generations live in a better country and a better world. Cover photo: A girl at the Sumpango kite festival, Sacatepéquez, 2013. Photo by Patricia Macías. Glenda Marisol Xulú was born in Pasum (Patzún, where the most beautiful sunflowers grow), on Maya calendar date Kab’lajuj Q’anil (August 22), 1991. She has a masters in Intercultural Bilingual Elementary School Education, and is currently pursuing her doctorate in High School Technology Education at the Galileo University in Guatemala. She has had the opportunity to work with children, teens, women and local authorities on topics like education, nutrition, empowerment, and sustainable agriculture. Over the years and through her experience she found her passion: to support, encourage, and empower people of all ages to be agents and leaders of change in their communities. She facilitates this through educational and skill-building programs on social issues (especially education), environmental issues, and political issues, to transform thoughts with a seed of change, building a more resilient and egalitarian community and country. She joined SERES in January, 2016, and since she has given her heart to what she does. Glenda facilitates SERES’ Actívates, the first series of programs to awaken critical thought in young people that helps them create action plans for personal change and community change. In her free time, she likes to think by playing sports, and reflect and learn through reading and visual media.